Madhya Pradesh is one such land in India that emits vibrancy from every nook and corner. The heart of India hosts the best cultural and heritage festivals that can't be seen anywhere else in the world. People of various caste, religions and tribes are currently nestled in Madhya Pradesh. All these fairs and festivals interweave souls of different religion and drench them in the color of festivities. Riots of colors, when scatters on the land of Madhya Pradesh, creates such an aura that nobody can resist it charm. During the festival season of Madhya Pradesh, tourists can see the best of Madhya Pradesh that is classical and beautiful. 1. Lokrang Festival Lokrang is a cultural festival in which all the dancers put their best foot forwards and matches their steps with the folk music. During the festival, the stage displays the various forms of folk dances, music, and ethnic dances. Also, one can see the beautiful collections of fans and handicrafts made by the tribal community of Madhya Pradesh. This festival's actual motive is to erase the geopolitical demarcations, make India a unified whole and to revive the year old tradition. 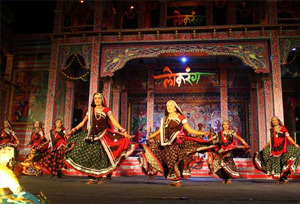 Lokrang fest is organized by the Madhya Pradesh Adivasi Lok Kala Academy. 2. Akhil Bhartiya Kalidas Samaroh Writers, Poets from around the world come together in the march for seven brilliant days of poetry recitation, story reading, and cultural performances. Ujjain is the hometown of many eminent writers and poets like Kalidas, Pandit Surya Narayan Vyas, Balkavi Bairagi, to name a few. The fest is organized to celebrate the work of the notable poet, Kalidas. Several plays of Kalidas, related to different themes like socio-political and cultural are staged during the event. Here, tourists can also see many stalwarts' performances by the budding writers. The fest is nothing less than a treat for eyes and ears. 3. Khajuraho Festival Dance and music should be the middle name of Madhya Pradesh. 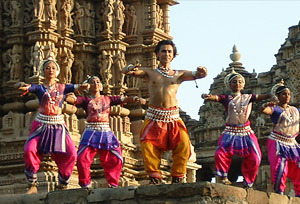 One week long, Khajuraho dance festival is the manifestation of the true India's dance forms. All the performances take places in an open air stage, right opposite to Chitragupta and Vishwanatha Temple. During this week-long cultural extravaganza, forms of dances are performed that have its roots in India. Here one can see the magnificent display of many art forms like Kathak, Bharathanatyam, Odissi, Kuchipudi, Manipuri and Kathakali. The temple shines like a star during the festival, especially its sinuous curves. As per the Indian mythology, the god and goddesses were the great lovers of music, dance, vocal singing and instrumental music. Every year the feast is observed to pay tribute to the creators of this gigantic temple and to celebrate dancing spirit of India. Another major attraction of the festival is the open-air market. Here up for grabs are many artifacts, sculptures and many other crafts made by the best craftsmen in the town. 4. 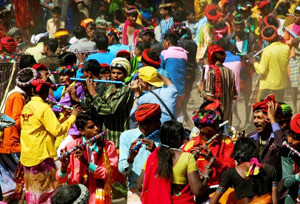 Bhagoria Haat Festival In the local language, the carnival is called as the festival of love. Celebrated with great pomp and show by the tribal people of Madhya Pradesh, Bhagoria Haat Festival is one of its kind in which young girls and boys have a right to elope after choosing their life partner. In this festival, a boy and girl put red powder on their partner's face if they like each other. Further, they run away from the ground and parents can't deny their relationship later on. On the other hand, if the girl refuses the proposal, the boy will run after to convince her for marriage. Some people even say that the festival is organized to celebrate the completion of harvesting. 5. 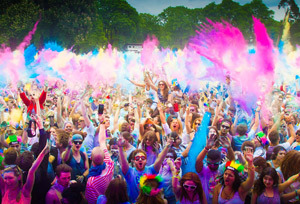 Holi Holi is celebrated just for two days on the last full moon day of the lunar moon. On days one, a bonfire is organized by the different temples. Day two is the time when the real extravaganza begins. On this day, people bid goodbye to winters and welcome the new season by coloring each other with colors and sharing sweets. Singing, dancing and the traditional beats of Dhol add to the gaiety of the occasion. Five days after Holi, Rang Panchami is celebrated by the tribal community of the state. 6. Ujjain Kumbh Mela Ujjain is one of those places in India where Kumbh Mela takes place. The festival is organized four times in every twelve years in the four cities of India- Allahabad, Haridwar, Ujjain or Nasik. 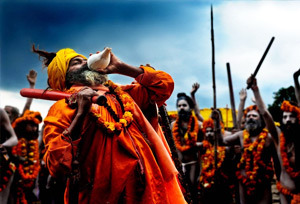 Kumbh Mela commemorates the victory of good in the battle of supremacy against the evil. A dip in the holy Shipra River washes away all the sins and ends the cycle of rebirth. Other then the ritual bathing, there are many other activities in which tourists can take part-devotional singing, debates about mythology and mass feeding to the people around. Attended by the millions of devotees, the festival speaks about the faith that dwells in every individual's heart. 7. Malwa Utsav Malwa Utsav is one of the biggest, largest and most spectacular events in Madhya Pradesh. Dance and music performances are the most integral part of the festival. Performers from different parts of the world come to Indore & Ujjain to be part of this spectacular celebration of art, music, dance, drama and culture. One can even say that the festival is the storehouse of culture and dance. In the festival, one can see the rich amalgamation of different cultures and tradition coming together to form a spectacular event. In- additions, the festival exhibits art and craft material. One can also savour delectable delicacies at the event. 8. Dussehra If tourists happen to be in Madhya Pradesh during October or November, check whether they can coincide their trip with the huge Dushera celebration. The festival donates the victory of Ram, over the demon king Ravan. Unlike other states, here the festival is celebrated by burning the statue of demon Ravan. In fact here, the Ravan is worshiped as he is personified as a symbol of prosperity and regarded as a savior by Kanyakubja Brahmins. 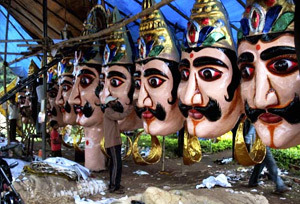 Kanyakubja is a Brahmin community to which Ravan believed to belong. A week long fest called Dushera Mela is organized prior to the festival. During the festival, processions take place, accompanied by the spectacular firework. One can see multiple stalls during the fest that offers some scrumptious delights. 9. Nagaji Fair Mainly celebrated in the tribal area of Madhya Pradesh, Fair of Nagaji is celebrated to remember the great saint, Saint Nagaji. He is being paid respect through this fair who lived about 400 years ago during Mughal Emperor Akbar's reign. Earlier, monkey trade used to take place during the festival and nowadays, only domestic animal trading takes place. Other than trading, many cultural and traditional events also take places during the festival. Musical performances by the tribal group are the eye-candy of the festival. 10. Diwali/ Deepawali A visit to the heart of India during the Diwali festival is an unexpected and delightful experience. Like other states in India, the festival is celebrated with zeal and vigor in Madhya Pradesh. Every Nook and corner of Madhya Pradesh is illuminated with colorful lights creating a kaleidoscopic against the backdrop of the dark sky. Madhya Pradesh is home to India's largest tribal population. In some parts of the state, the traditional tribal festival is performed to mark the commencement of the festival. Diwali is a festival of joy, splendour and is celebrated for five long days. On the first and second day, Dhanteras is celebrated. On the third day, the main festival takes place where people pray Goddess Lakshmi and burn crackers. The fourth day is a celebration of Govardhan puja. Finally on last day, Bhai Dooj is celebrated. This day marks the end of five days Diwali celebration. 11. Chethiyagiri Vihara Festival One can see the massive moment of Buddhist monks and followers during the Chethiyagiri Vihara Festival to Sanchi. People come here to see the relics of the two great disciples of the Buddha, Sariputta, and Mahamogallena. All these relics were founded in the stupa no 3 of Sanchi in the year 1853. Nowadays, these artifacts of great Buddhist people are displayed just for this festival and pilgrims come from around the world to pay homage to them. These relics were endowed in the stupa no 3 of Sanchi in the year 1853. 12. Tansen Samaroh or Tansen Sangeet Samaroh If the sole purpose of coming to India is just to hear some soulful rhythms of classical and folk music than Tansen Musical Festival is a wonderful platform. The festival is the oldest and one of the best musical festivals in India and is a tribute to legendary musical maestro Tansen. Music legend Tansen was one of the nine gems of Akbar's court and took folk music to a new level by composing eloquent ragas. During the festival, musical personages gather under Tansen Tomb and do make musical performances for four days. The fest acts as an amazing platform for new comers to perform their best in front of the world. 13. Pachmarhi Utsav Pachmarhi Utsav is held every last week of December, feature the best of folk art from Madhya Pradesh and all over India, with demonstration, workshop, and exhibition. For five days, every evening a cultural evening is organized that feature artists of national and international repute. There are also many stalls inside the festival that serves scrumptious food. Inside the exhibition, the things on display are carpets, bamboo, dress materials, and sculptures produced specially by the local people. So, plan a trip to Madhya Pradesh in such a way that tourists can savour the essence of the festival. Madhya Pradesh is a land of celebration. In the heart of India, every day is a festival. Here, one can see more of dance and cultural festival other than the traditional ones. The list of festivals is just not ended. Mentioned below are some more festivals and feast that can be enjoyed on a trip to Madhya Pradesh. Akhil Bharatiya Kalidas Samaroh Ujjain Literary Presentations along with dramas and Indian Classical Dance programmes. Dhrupad Samaroh Bhopal Vocal perfromaces of Dhrupad style of Indian Classical Music. Allauddin Khan Sangeet Samaroh Maihar, Satna Indian Classical Music. Ameer Khan Festival Indore Indian Classical performances. Rashtriya Hindi Natya Samaroh Bhopal Hind's Best Drama's performances. Pachmarhi Utsav Pachmarhi Indian Folk Art's performances. Keshav Jayanti Samaroh Orchha Literary Presenatation. Alauddin Khan Vyakhyanmala Bhopal Lectures based on Classical Music. Muktibodh Samaroh Bhind Literary Programmes. Bhavbhuti Samaroh Gwalior Sanskrit's Literary Programmes. Makhanlal Chaturvedi Samaroh Jabalpur Literary Programmes. Rashtriya Ramleela Mela Different Parts of MP Country's Best Ramleela Mandlis Performance. Pt. Balkrishna Sharma "Naveen" Samaroh Hindi Literary Programmes. Rajshekhar Samaroh Sanskrit Literary Programmes. Lokrang Samaroh Bhopal Indian Folk Art's Presentation and performance. Pt. Kumar Gandharva Samaroh Dhar Sanskrit Literary Programmes. Padmakar Samaroh Hindi Literary Programmes. Bhoj Samaroh Dhar Sanskrit Literary Programmes. Kabir Samaroh All over Madhya Pradesh Folk Arts, Music, Dances and Literary Programmes. Jagar Samaroh Indian Classical and Folk Arts Display. Krishna Rao Samaroh Gwalior Indian Classical Music. M.P. Sangeet Samaroh Throughout Madhya Pradesh Nimar Utsav, Maheshwar Indian Folk and Classical Performances. Bharat Bhawan Bhopal Various Folk arts exhibition and performances throughout the year. Subhadra Kumari Chauhan Samaroh Hindi Literary Programmes and performances. Film Festival Bhopal Films from India and Abroad.